Hey there! Ran some streets this morning and it looks like some nodes were missed because they were off the road / on private property. The “map” map shows roads as continuing, but as you can see from the “satellite” map, the roads end or the nodes are in private parking lots. I’m doing this for the Rochester Running Co. “run every street Roc” challenge in Rochester NY. Google street view shows a gap in that barbed wire fence at the end of Addison St. So I would head back there, hop the fence, and bushwhack your way to that cluster of nodes! Then you will be a true Citystrider! Less fun option–flag the offending street and hit the ‘mark as complete’ button. Thanks! Done. But I’m not sure that will work for Rochester Running Co’s #runeverystreetroc challenge. But perhaps! Which CityStrides street page is shown in your screenshot @bojshoemaker ? I’m not sure what you mean by what page. 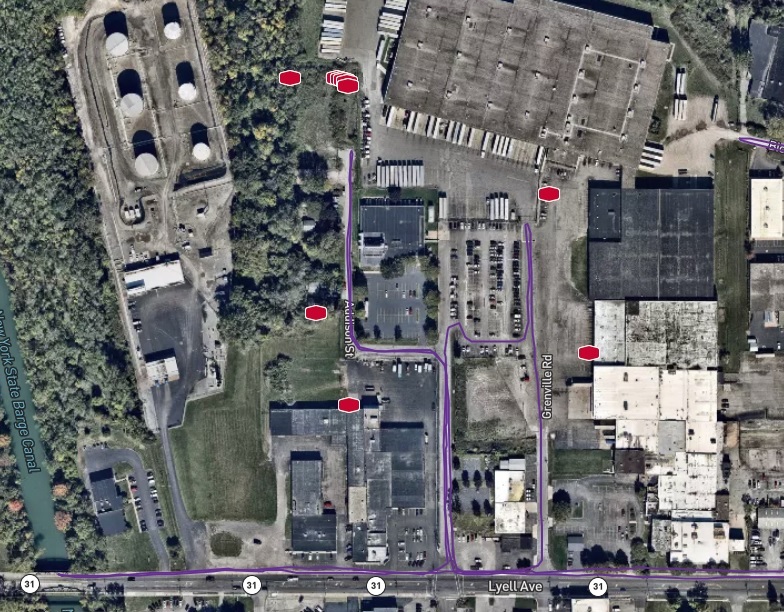 It’s the satellite map of the area from the citystrides site. The satellite image is accurate; it’s just that the nodes are located in areas that are not a street. The “map” map is inaccurate in that it shows the streets progressing further than they do on the satellite map/in reality. Thanks! I’m wondering where you are in the site when viewing those particular Nodes. I need to know what the name of the Street is in CityStrides that is showing those Nodes. Maybe you’re on the Rochester page and you clicked the ‘eye’ button to view a particular Street - in that case, I’d like to know the name of the Street you clicked. Another way to do it is to click the ‘external link’ button that’s next to that ‘eye’ button - that’ll take you to another page just for the Street… for example, 1st Street. Ah. I’m just on the lifemap and clicked on the node hunter button.